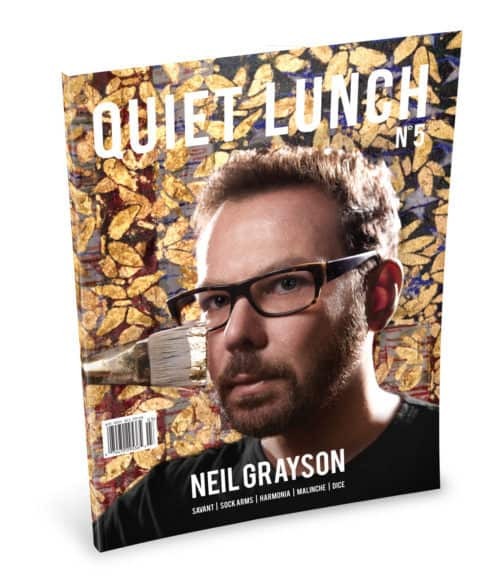 Caveat Brings "Intelligent Nightlife" To The Lower East Side | | Quiet Lunch. The still somewhat quaint, Callery pear tree-lined Clinton Street on Manhattan’s Lower East Side has served as an ongoing case study in urban advancement since the early nineties when it transformed from a drug-swirling hotbed to niche culinary destination. Molecular gastronomy pioneer Wylie Dufresne’s wd-50 led the gentrifying charge in many ways, but it was the restaurant’s late 2014 closing after a valiant 11-year run that signaled a cultural and economic shift towards something else; something considerably more “American” in that basic homogenous branding sense and less the nostalgic, now seemingly abstract “cool” downtown New York way. Such is the curve, still curving. In the summer before wd-50’s shuddering (the building sold for condos), Culturefix-a bar/gallery/event space that reintroduced a youthful artistic anarchy to the street-agreed to amicably part ways with its hobgoblin landlord after a difficult but glorious five-year run. This was a brutal blow to the area’s non-bridge & tunnel social scene. After some short pop-up stints and almost two years of total vacancy, it is now ABXY Gallery. Another key closure in the landmark Clinton Street trilogy was matriarchal stage actor and director Judith Malina’s experimental and at times radical The Living Theatre. Malina, facing rising rents and failing health, kept the space afloat primarily by procuring large donations from her famous chums, Yoko Ono and Al Pacino. The theater closed in the spring of 2013, but its spirit officially moved on in many ways after Malina’s passing in April 2015. This trifecta venue erasure marked the street’s (once a neighborhood unto itself) last cultural high-water mark. Much like 9 Clinton’s white-box duplex space, the former Living Theater haunt at 21 A Clinton Street had its own set of starts and stops. The Celebration of Whimsy Theater or C.O.W. 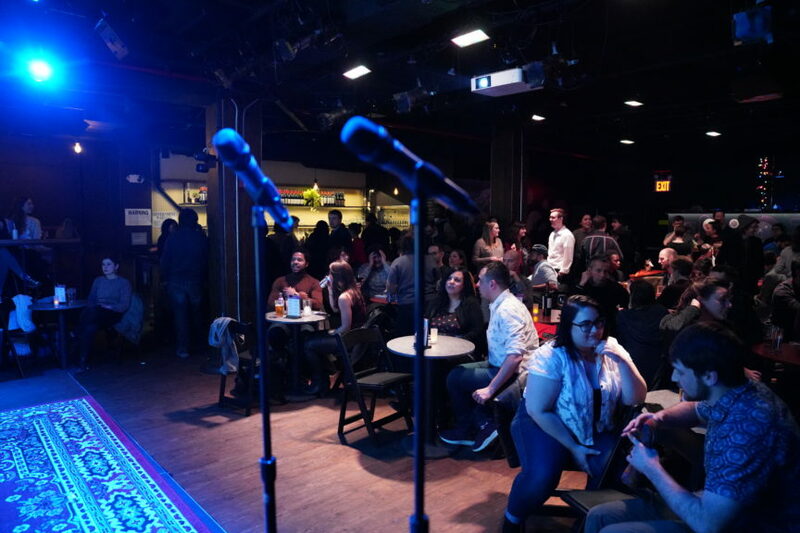 could probably take the most credit for carrying the street’s artsy, Off-Off Broadway, nightlife torch during its three-year run in the space. After a series of Indie theater shows, cabaret-style performances and a wide-array of various events, corporate included, C.O.W. eventually closed its door on May 16th, 2016. 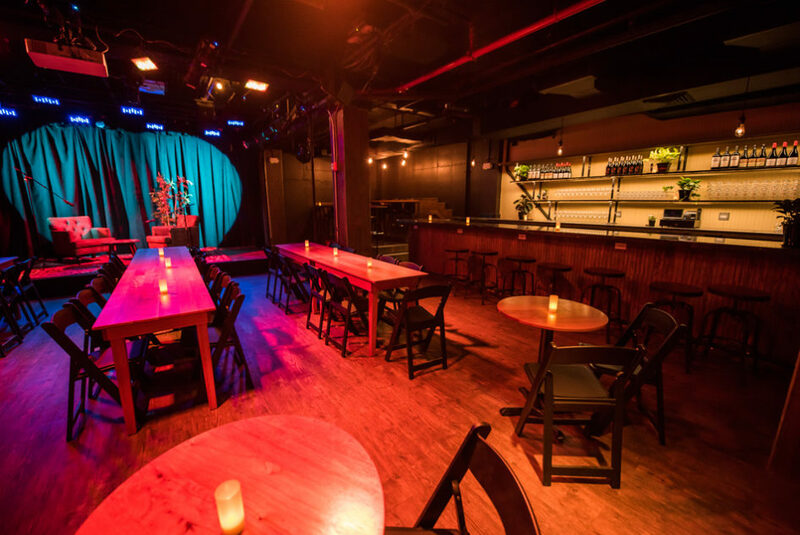 Patrons of the Clinton Street-level holdout, Cocoa Bar-a coffee, wine and tapas spot that shares the 21 Clinton address-have watched the former Living Theater vessel function and flounder with feigned enthusiasm at best over the years. Cocoa Bar’s lively Persian owner, Bahman Soltani, a former filmmaker and jazzy raconteur, had a good feeling about the lasting potential of the next incoming occupant of the once hallowed performance space. This was and almost eight months later, still is, Caveat. Caveat by day. Photo by Dennis Cahlo. 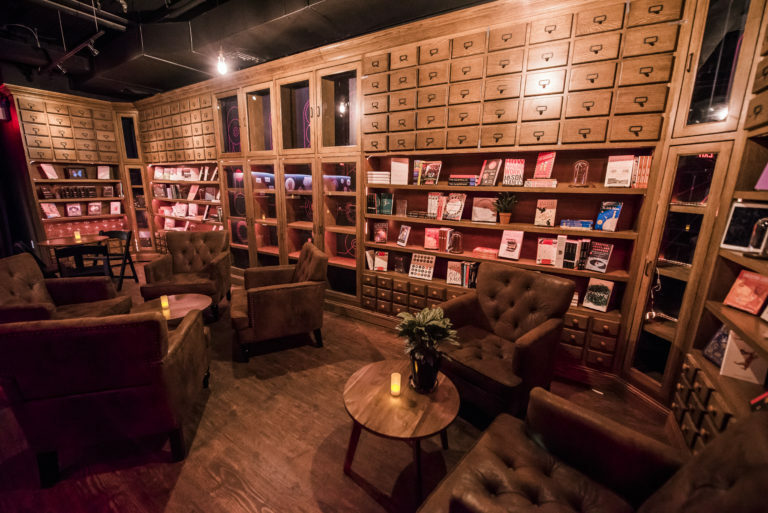 Caveat is a speakeasy-style cabaret space that combines the carefully curated storytelling tropes of The Moth and TED with the irreverent downtown swag of stand-up comedy and the quick wit of seasoned UCB performances. The venue hopes to bring “intelligent nightlife” back to New York City and it appears to be doing just that. Caveat is quickly becoming the most intriguing cultural destination on Clinton Street since Chef Dufresne squeezed out his last dollop of ginger carrot foam. 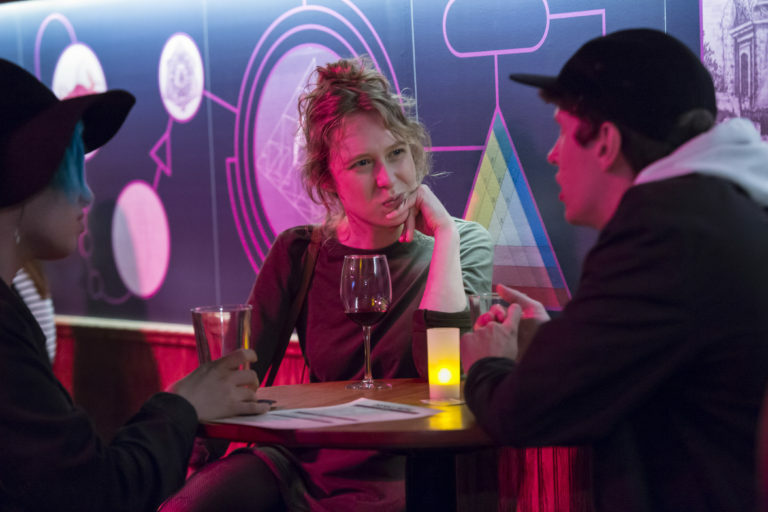 Co-founded by former particle physicist Ben Lillie and multi-media theater director and producer Kate Downey, Caveat opened in the fall of 2017 and is well into its stride. The ambitious pair initially bonded over a shared predilection for making otherwise “difficult” subject matter (science & philosophy) not just accessible, but wildly entertaining. This was back in 2015. Kate and Ben, surrounded by Fawkner’s eerie taxidermy, immediately hit it off, bonding over their shared appreciation for science, comedy and the nuance of quality storytelling. Downey went on to explain her background with Museum Hack (founded by Nick Gray), a company that leads “renegade tours” through major museums such as The Met. After graduating from Northeastern University with a theater degree, Downey moved to New York to work for The NYC Opera, which went bankrupt in 2013, but got revived (for the most part) in 2016. After directing various Indie Shakespeare productions, she soon found herself working in the production department at The Public Theater, but quickly ran into the same issues with falling attendance, decreased funding, and a general lack of institutional self-awareness. Caveat by night. Image courtesy of Kate Downey. After embedding herself in the museum community, Downey dove into the sciences and academics. In the back room of Fawkner, she and Ben discussed how physics and other scientific subjects are intrinsically tied to our lives and everything around us, but in many ways were and still are deemed fatally exclusive. “You have every right and reason to know about it [science] to whatever level you’re into,” says Downey with a sense of urgency. Beginning May 30th, Caveat will launch The Underground Science Festival, which promises to “unearth science buried by sexism and racism.” The series will feature 17 events in one week, all celebrating science’s unsung heroes who didn’t get recognized due to a prevailing “glass ceiling” culture-then and now-as well as aspects of science that do not find representation in mainstream circles. The inaugural show will be Rosalind Franklin’s Revenge: A Show for the Scientists That Deserve It. 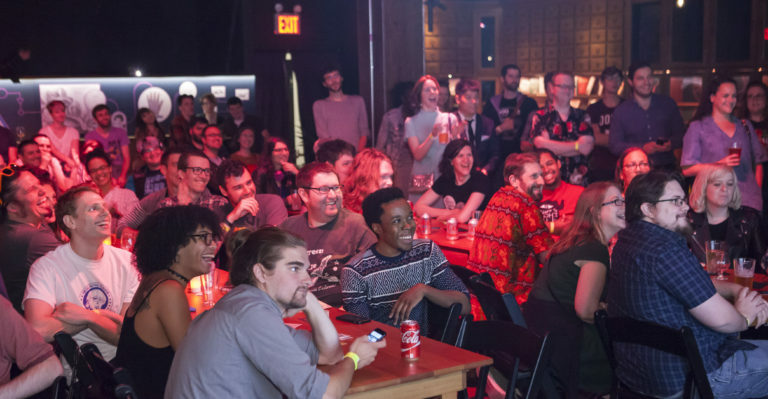 Not terribly interested in being around people with the same story, Lillie began downloading the experiences of others, while exploring the architecture of comedy and storytelling within The Moth paradigm. Clearly a gifted thinker and speaker, he soon got hired in the editorial department of TED, working out of their NYC headquarters. Lillie later created The Story Collider, a hybrid platform (of sorts) of the aforementioned institutions, now run by Erin Barker and Liz Neely. Story Collider celebrated its eighth birthday at Caveat on May 1st. It currently runs out of eight cities and functions as a self-sustaining non-profit. 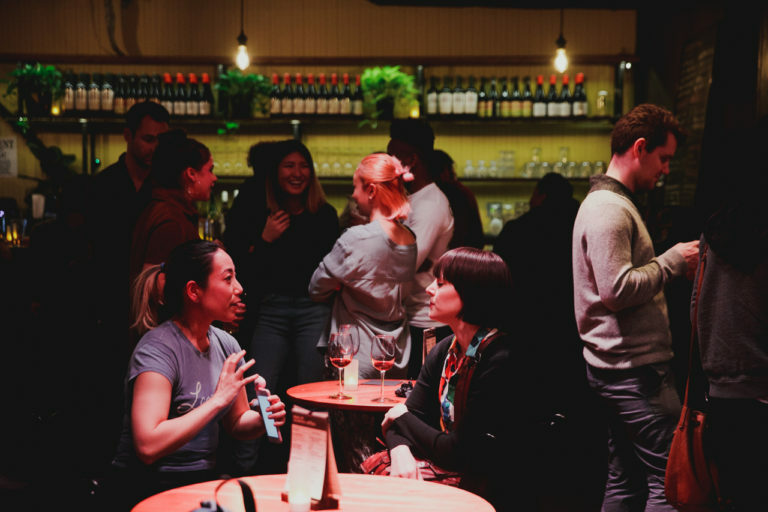 The methodical learning curve regarding events and promotion, not to mention discovering the secret to telling a good story (have a point, keep it short), prepared Lillie in many ways for the opening of Caveat. Caveat’s library. Image courtesy of Caveat. What about the astonishing discoveries that lie ahead in the actual scientific world? Does Ben Lillie miss the lab or ponder about what comes after the Higgs boson discovery? “No, not at all. It wasn’t for me.” Instead, Lillie surrounds himself with either extremely funny, highly intelligent, or extremely funny and highly intelligent individuals, all under one roof. Lillie and Downey recommend you do the same, not only as small business owners on Clinton Street, but as concerned and thoughtful members of the human species. It’s not all food for thought, however. There’s beer, wine and “little bar food things like nachos and grilled cheese and stuff,” which visitors can enjoy while consuming more insane programming like An Inconvenient Truth 3: Maybe I Wasn’t Clear the First Two Times, which sees gifted comedian (check out DiWREKTed at Baby’s All Right) and Inverse contributor Rollie Williams playing Al Gore as late-night talk show host. There’s also Kate Villa and Peter Johnston’s “academic and thinky,” CONFLICTED, which chronicles epic fights in science, whether physical or political. June 2nd will explore The Matilda Effect: How Science Hides Women’s Achievements. Caveat is located at 21 A Clinton Street, New York, NY 10002.